My name is Madison Abernathy, and I’m a Regional Vice President here at Crowned4Success. I’m one of the co founders of The Gamma Collective, a community and learning resource for aspiring female leaders looking to build a lasting brand in their niche. At Gamma, I’m in charge of our sales, strategy, and customer experience and deal mainly with our course creation. Now then, I won’t bore you with a long winded intro about me because we both you why you’re here: time to make that money, honey! So many women dream of owning their own business or working from home. My Girl Gang and I have been so remarkably blessed to spend over a year in our entrepreneurial journey, building our business from scratch. We’re still growing and learning but every day is truly an adventure. We’ve learned a lot over the past year but I’m truly grateful that everyday is a chance to grow and use our superpowers to change lives. 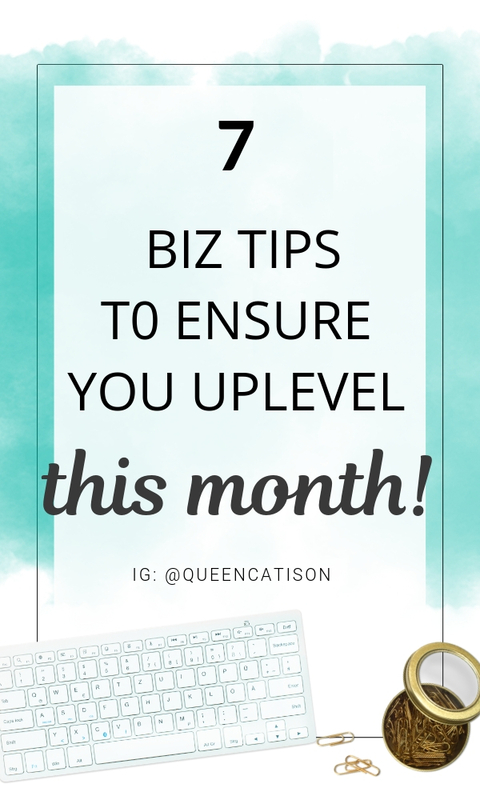 With 2019 upon us, I want to share with you 7 ways you can uplevel your business. If you aren’t doing all of these things right now, it’s seriously time to make moves. Sit down and create a vision of where you want your journey to take you. Why? You can’t achieve your goals if you don’t actually know what they are. A clear focus will help you make the right choices to stay on track towards your goals and prevent from going off course. If this is a pain point for you, it’s time to jump into the I recommend sitting down to meditate on what you ultimately want. What does your dream life look like? How does your business plan in to this? Creating an outline of your goals is a powerful first step in achieving them. Setting SMART (Specific, Measured, Achievable, Relevant, and Time-Bound) Goals that align with your vision should make it much easier to make decisions and find success. Set both big and small goals to help you execute your vision. Did you know that entrepreneurs with a mentor are 5x more likely to actually launch their business? Getting a mentor is an amazing way to level up a pre-existing business, too. A mentor can help you understand the ins and outs of your industry but also help you stay motivated. Entrepreneurship can be a difficult road to navigate and losing focus is easy. Seek out a mentor whose success you’re crushing on and listen to her advice. You can find a mentor within our private Facebook Community here or seek out mentoring from any of the coaches here at Crowned4Success. Our coaches are available here! Killer branding is crucial to up leveling your business! Great branding builds credibility, creates a cohesive feeling, and helps to differentiate you from your competitors. Just like your voice and personality are uniquely yours, your branding should showcase the unique personality of your branding. Don’ forget: a brand is so much more than pretty color palettes and typeface selections, especially as a soloprenur! This is a direct reflection of who you are going to show up as in your business and should be attractive to your ideal client and target market. It’s very easy to get stuck in this space, so do not hesitate to reach out to us for help or use any of the resources! It’s easy to have an “if you build it, they will come” mindset but that’s far from realistic. Truly, it’s your audience you should be building. Your content might be incredible, but you can’t use any of it to convert visitors to clients if no one is actually seeing it. You don’t have to wait until your social media, website, sales pages, etc are all perfect and beautiful to start building an audience! It’s okay to launch less than perfect and continue to grow with your client base. The most important part is to start reaching out and sharing your message. Your ideal client is going to connect most with your unique voice, not the the over priced stock photos you had a panic attack over last night! The entrepreneurial journal can be incredibly lonely so it’s important to stay connected. While we do recommend face to face, making a new online friend is cool, too. Not only is it good for you mentally, it can also be a great boost in productivity. Having someone to bounce ideas around with could help you get unstuck and inspire you all at the same time. We’re passionate about #CommunityOverCompetition at Crowned4Success. Looking for your new home, I suggest you start here. Girl, do not skip this step! When I heard other boss babes or coaches talk about mindset work, I immediately blew it off. What did my mindset have to do with getting clients?! Uh, everything. It wasn’t until I truly mastered mindset work that I started making progress. If you’re not in a really good place with you, not being the most authentic version of yourself, or leading with a servant heart the whole universe will feel that vibe and it’ll be ten times harder to attract the right kind of clients. If you’re new to mindset work, we suggest starting taking stock of your life with a Wheel of Life exercise. The Wheel of Life is one of the most well known coaching tools in the industry, and you can DIY it with a quick Pinterest Search. There you have it, Queen! So, what about you? Are you on an entrepreneurial journey? How did you find success and what other pieces of advice would you give to other aspiring boss babes? New here? Where are you feeling stuck? Tell us more about you in the comments section!